Easy to grow, baobabs are suitable as bonsai or indoor plants as well as outdoor plants (in tropical or subtropical countries in that case). - 1 species endemic to Australia : Adansonia gibbosa (= Adansonia gregori ). 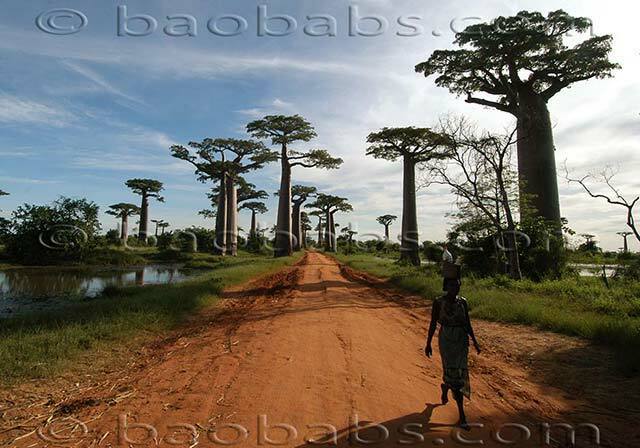 The malagasy baobabs occur generally in deciduous forests in the half west part of the island. 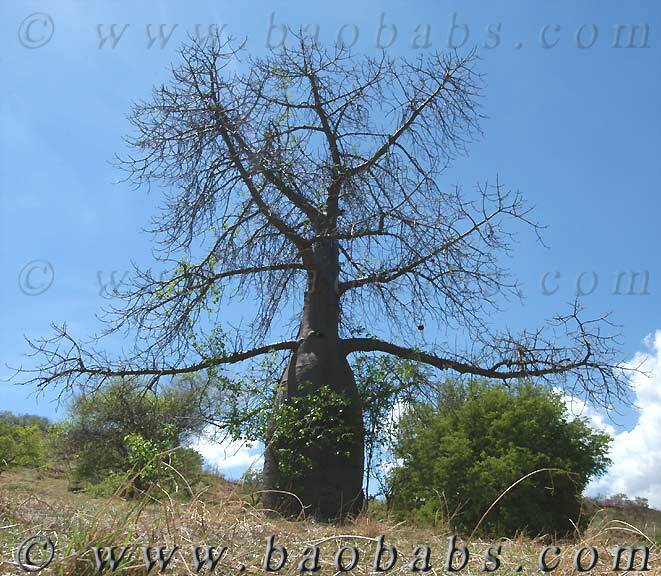 Some areas are appropriately named " baobab forests " because the baobabs constitute the dominant tree species. Concerning the interaction with animals and with humans, the ecological role of baobabs is very important. 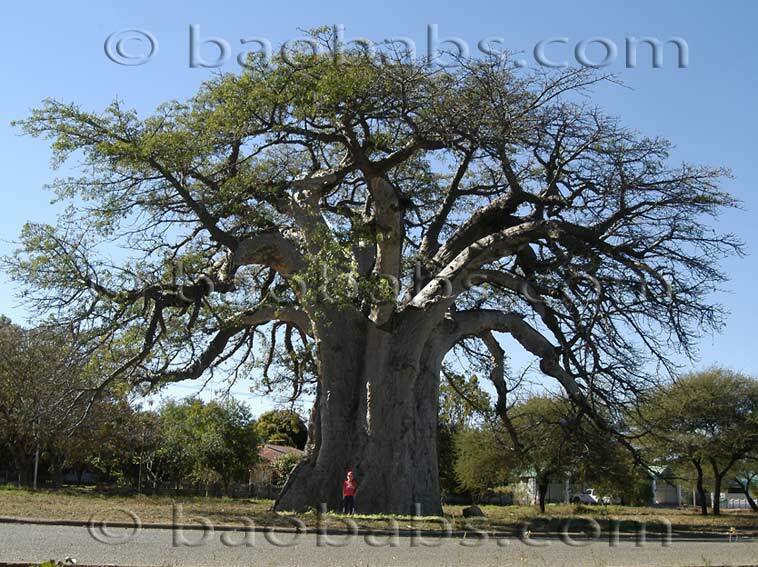 Baobabs are small (3m) to large (30m) trees with massive trunks and compact crowns. The forms of the trunks are variable, from bottle-shaped to tapering or cylindrical or irregular. 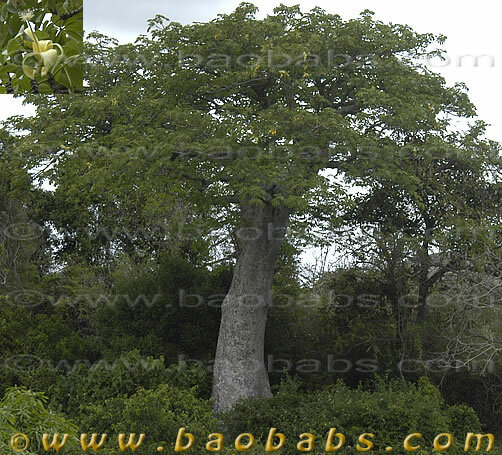 But baobabs are very distinctive from other trees and easily recognizable. Their bark is smooth and the wood is fibrous and soft, stocking water for the long drying periods. 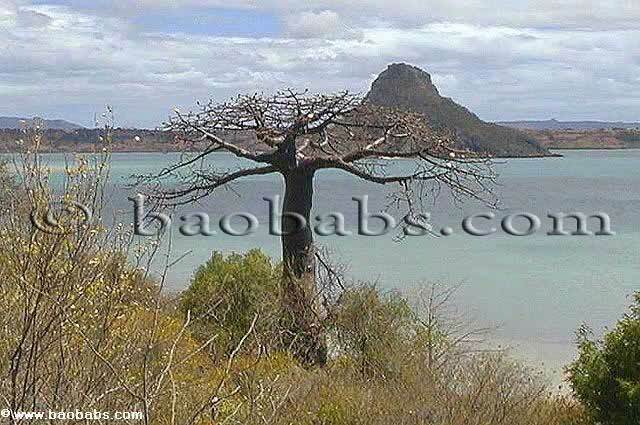 The baobabs are deciduous trees, without leaves for many months. That is an explanation to the common name "upside down tree". 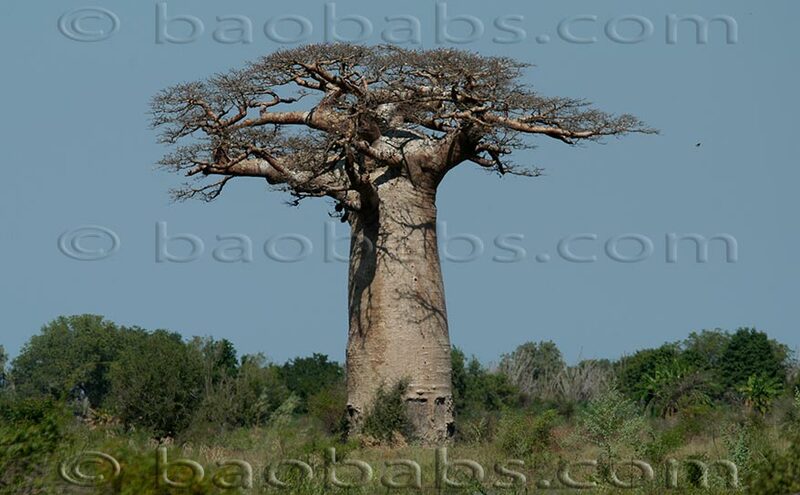 The African baobab is the most important babobab-tree in number and also the better known among the 9 species. Unlike the 7 other diploid species, it is tetraploid. This means that it has 4n chromosomes in its cells, the diploid number of 2n being the normal number. It is indigenous in the semi arid part of the sub-Saharian Africa. Adansonia digitata has a character which is unique in the genus: the flowers are pendulous . The tree is usually massive, reaching 25m in height and up to 12 m in diameter, with an irregular crown. The bark is grey, smoth, some times irregurlarly tuberculate. The flowers of Adansonia digitata are white. 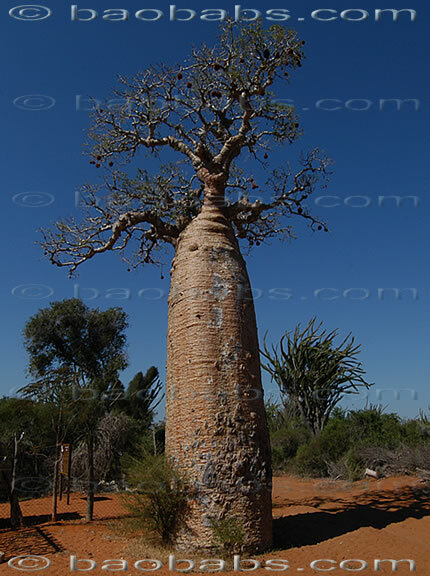 One of the six species of baobabs endemic from Madagascar, perhaps the better known of Malagasy baobabs, and for a lot of people, the most aesthetical of all baobabs. A pure gem. Often represented on the front cover of books dealing with Madagascar. 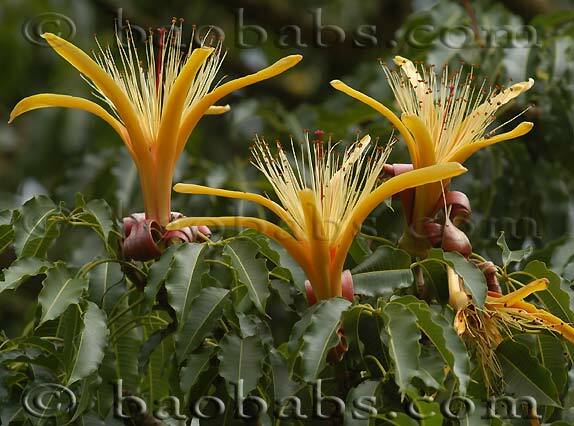 Grows in dry or moist forests in the Mahajanga province and also in the North of Madagascar. 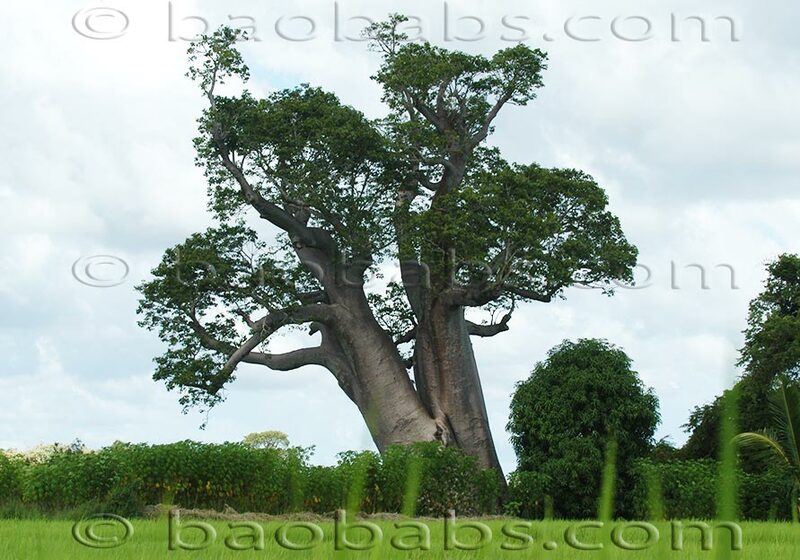 The Baobabs (genus Adansonia) are hardy tropical plants and so easily suitable as indoor plants or bonsai plants . Depending of the species cultivated and the conditions of cultivation, they are often dormant and without leave for a part the year. 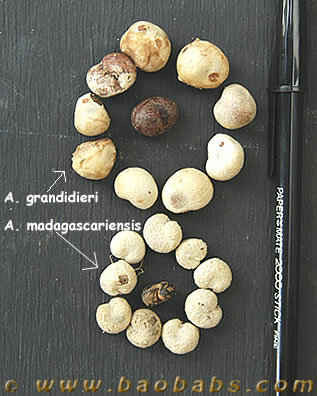 The seeds are reniform, generally about 12-14 x 10-12 x 9-10 mm, excepted for seeds of Adansonia suarezensis which are bigger. The sowing is in fact simple and easy. 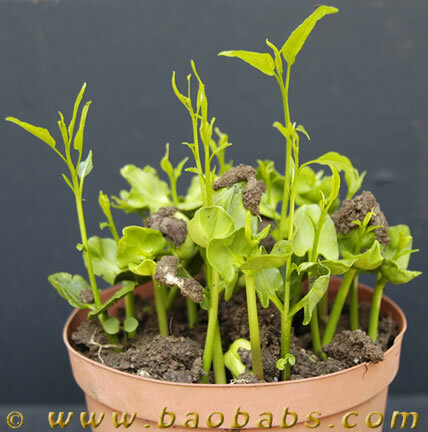 But the germination can be eratic, either occuring quickly with a good ratio or long with a bad ratio. It depends of the temperature and humidity of the soil, and certainly of other parameters which are not well known. 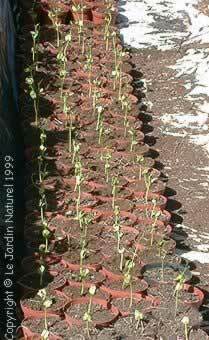 Generally in good conditions, seeds germinate after a week to 10 days. After some days the seeds germinate, the two cotyledons can be fleshy (ex. Adansonia grandidieri) or flat (ex. Adansonia za). The Adansonia species are generally easy to grow in pots as indoor plants or bonzai and are resistant to dryness. They are quickly developping an underground caudex. They are some notable differences between the species concerning growing speed. Adansonia gibbosa (the Australian baobab) is very slow and extremely sensible to rot and demand high temperatures for growing. At the other side, Adansonia digitata ( the African baobab) is fast growing and well resisting to rot attacks. The medium for cultivation must be well draining and I suggest to add some river sand to the mixing of half humus half soil. The plants can be well watered during the hot season and soil must be kept quite dry during the dormance which occurs generally from the end of summer to spring.